Whilst on your trek, guides are the main person to lead you, show you the trail. They tend to speak reasonable English (or your language) and know the route. They are well versed with the place, people, nature and culture. They assist with getting hotel rooms (or arranging the tents), meals and any other issues that may occur whilst on trek. All our guides are trained at the government training centre - Nepal Academy of Tourism and Hotel Management (NATHM) and are licensed by the Department of Tourism, Government of Nepal. We also support assistant guides /knowledgeable porters on their quest to become trek guide by sponsoring them for the training at the government training school. Have basis knowledge of first aid and operation of medical kits. Multi lingual - Spanish, English, Japanese, French, Germany and other languages. Practical knowledge of basic operations of tours and treks. Nepal is a land of villages, hills and mountains. 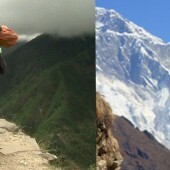 Trekking is conducted in the remote lands and the hills of Nepal which are not accessible by the roads. You walk on the hills, mountains and the remote lands by enjoying the nature and culture of those particular areas. Along with these you'll have the porters who will be there to assist you with the luggage. Satori Adventure being the strong follower / supporter of IPPG (International Porter Protection Group) and follows its five guidelines on porters safety, ensures that the guest will have the best reliable porters and also the porters are well taken care. To support the local economy with our trek operations, we mostly employ the people from the local area as your porter. All our porters get decent wage and freedom from overloading. Their daily working hour is normally the same as the guide as determined in the itinerary. Most of the porters eat and sleep in the same lodges / guest houses as the tourist groups are staying in. There are also people from non-tourism industry, who work purely as a porter, and are also employed in some of our operations when the regular porters working in tourism are unavailable during the peak season. They are stronger than the regular porters and tend to cook their food by themselves whilst on the trek in order to save money.